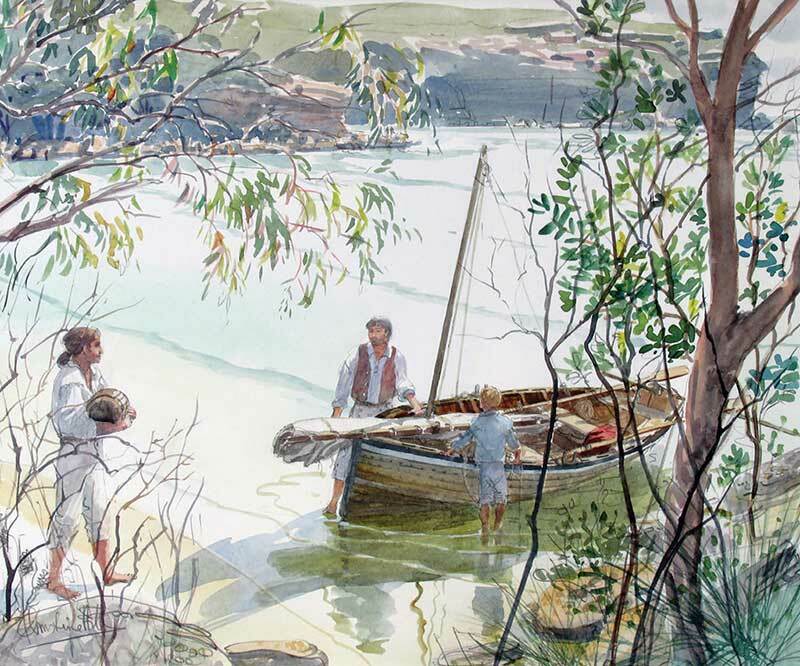 Matthew Flinders, George Bass and their servant-boy William Martin explored and mapped the coast south of Botany Bay in one week during March 1796. 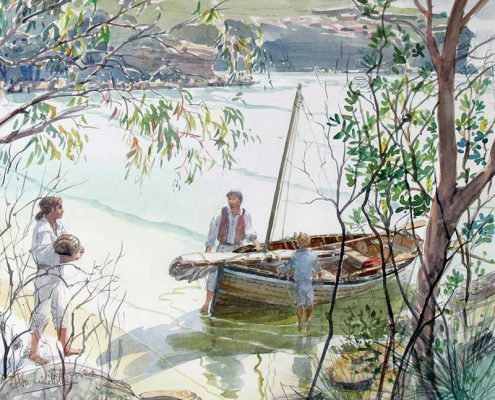 They had already made a trip from Port Jackson to explore the coast as far as the Georges River, in a small boat George Bass had brought out from England on the HMS Reliance. As their boat for that journey had been named Tom Thumb, they named the new colony-built vessel for their second expedition Tom Thumb II. In this second trip they had a series of adventures culminating at the Hacking River, where they were surrounded by ‘sea monsters’ – or sharks as we would call them today. 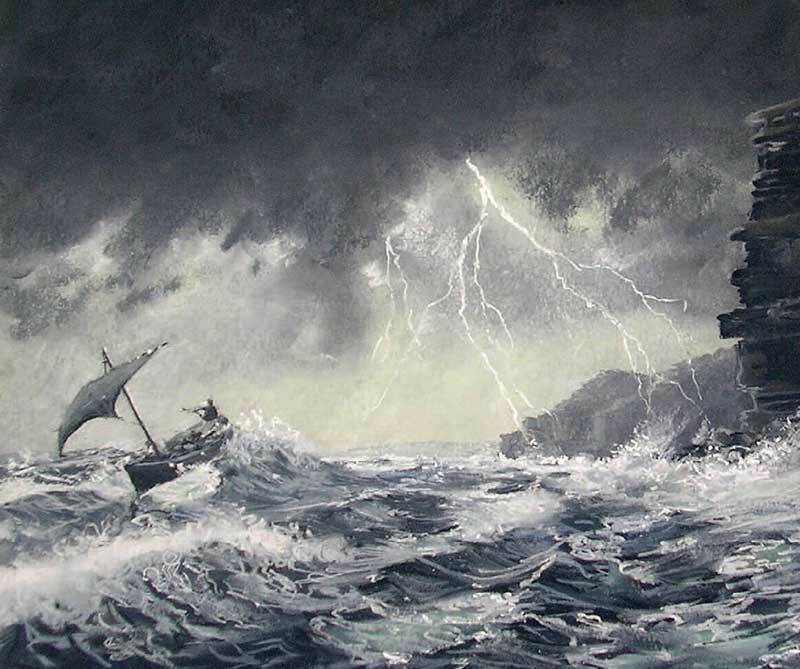 It came about because I first did the paintings illustrating the voyage and wrote up a short descriptive piece for each one. 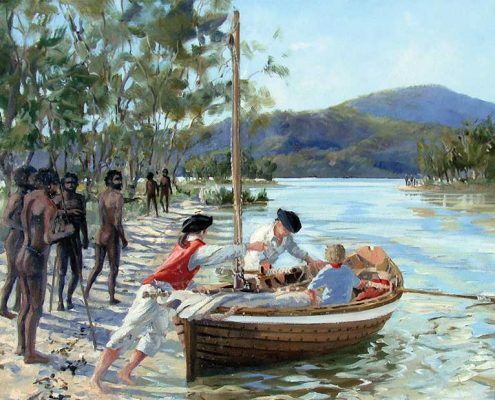 Something I discovered in all the research for the paintings … Although many Australians remember the story from their schooldays, there are very few illustrations – and those which do exist are not very truly descriptive of the time and places of the events. I never set out to write a book! 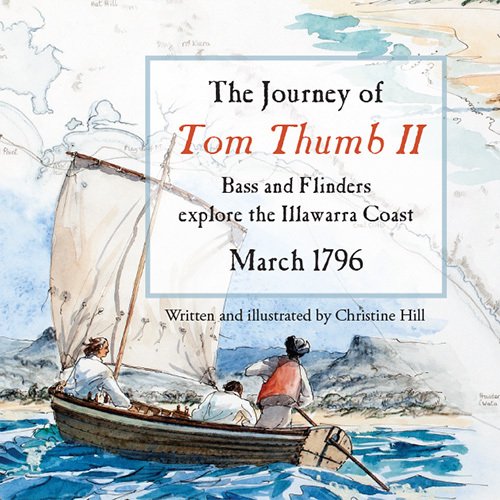 My interest in the story of this particular journey by Bass and Flinders was whetted a few years ago when I attended a talk on the subject by Mr Paul Brunton, Senior Curator at the Mitchell Library. The Library featured the story in a fine exhibition complete with a replica of the Tom Thumb II which in those days was usually kept amongst the vessels displayed by the Sydney Heritage Fleet in their premises at Wharf 7, near the Australian National Maritime Museum at Pyrmont. This particular replica boat was built by Mr Ken Gervens for a re-enactment voyage in 1988, and I was glad to be able to spend time studying it with my sketchbook and camera before the Heritage Fleet removed it permanently to off-site storage. This is a story dear to the hearts of South Coast people, especially those who know the beaches between Port Hacking and Lake Illawarra where most of the action took place. Generations of primary school children learned about it, but ten years ago when I began looking, the only illustration I could find was an illustration by Julian Ashton in the Picturesque Atlas of Australia 1888, which has often reproduced when the story was mentioned in other works. More recently I have seen other illustrations in children’s stories, but they never showed the genuine location. I spent many hours making sketches and taking photos, talking to experts and considering Flinders’ journal and other descriptions of the terrain, to establish the lie of the land and the scene as accurately as I could. I also had to study 18th century engravings to establish the clothes worn by the explorers and the style of the Aboriginal people at the time, and handwriting examples in diaries and ships’ logs of the time, to create a realistic map of the journey (see the cover image, previous page). Crucially: I needed to know the exact position and phase of the moon and how it impacted the night scenes. One by one, I visited all the locations of the events in the story of that week-long adventure. And it was an adventure – remember, they were three young men exploring a strange land. 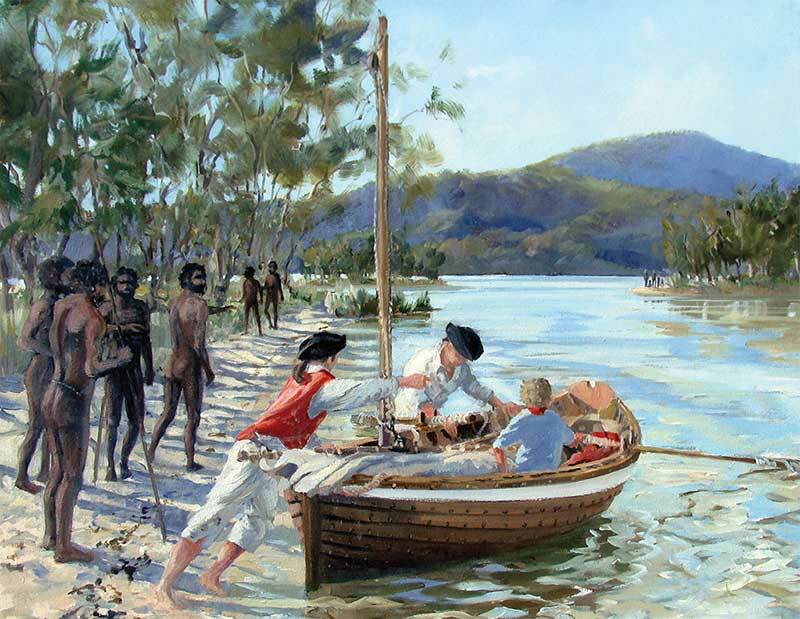 The colony at Port Jackson was only six years ‘young’, and up until this time, there had been little exploration further than a few day’s walk (struggle) through the bush, and certainly no ocean voyages because the construction of boats big enough for the purpose was not allowed (to dissuade escapers). The places where Tom Thumb II rested overnight, whether on its stone anchor at sea or on land, have of course been named since that time. 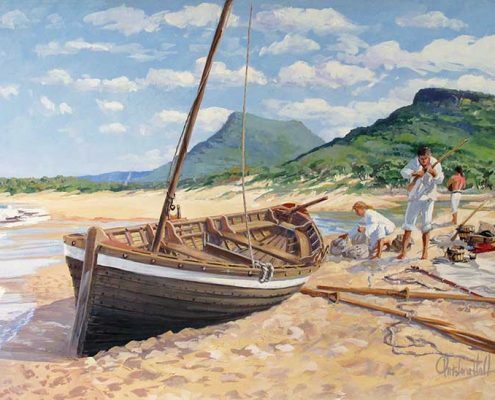 We now know Towradgi Beach was where the boat was ‘dumped’ by the surf; at Lake Illawarra’s entrance they trimmed their Aboriginal visitors’ hair; Bellambi offered a comfortable night’s rest ashore, and the high cliffs of the Royal National Park revealed beautiful and sheltered Wattamolla cove. 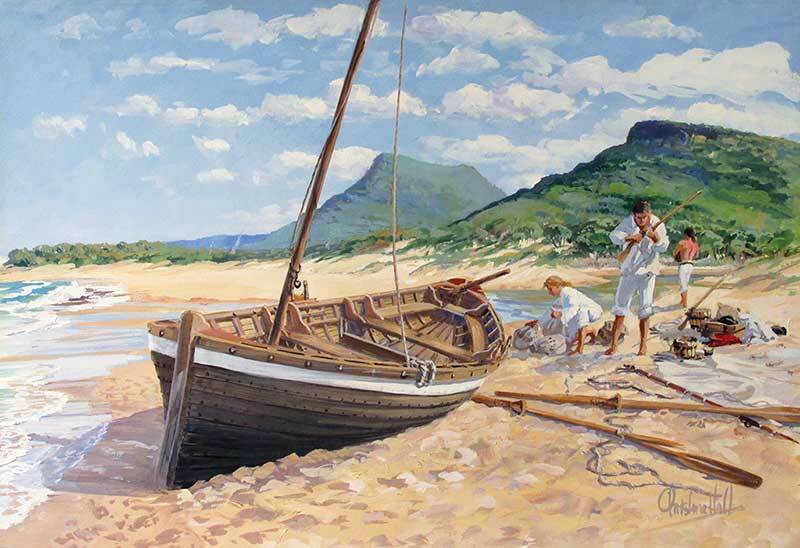 Historians in the past have marked beaches around Thirroul and Bulli as most likely to have been the place the young adventurers called Barn Cove. Coalcliff and Stanwell Park are nearby and although these names did not exist on Flinders’ chats, the locations were part of the scene in this story. The Illawarra Historical Society in Wollongong published a book by W.G. McDonald in 1975 which describes Bass and Flinders’ various explorations in the Illawarra district, which was of great assistance to me in defining the places I needed to visit. 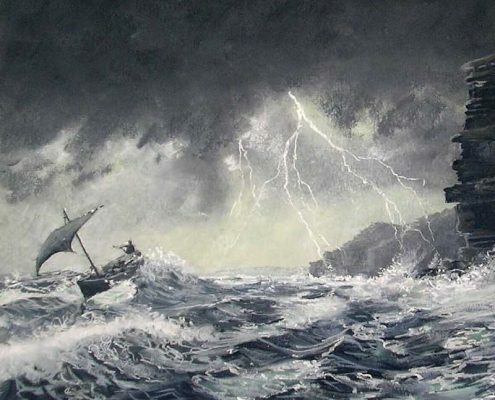 The author, in conjunction with other historians and mariners, went into great detail about the supposed track of the little vessel along the coast and bays, and where the young adventurers probably landed. McDonald’s sources listed Flinders’ manuscript of the voyage, that it was the property of Miss Anne Flinders Petrie and that it was kept at the Greenwich Maritime Museum in London. I found it in full on the Museum’s website and before making any paintings printed myself a copy which has been my go-to reference since then. Over the years since I have read many, many accounts of this story in different books. The original source is Flinders’ own writings, whether from the original manuscript that I have used, or his later more comprehensive major work A Voyage to Terra Australis. Every writer used this and many were able to add information from other people’s histories to flesh out their telling of the story and its context. 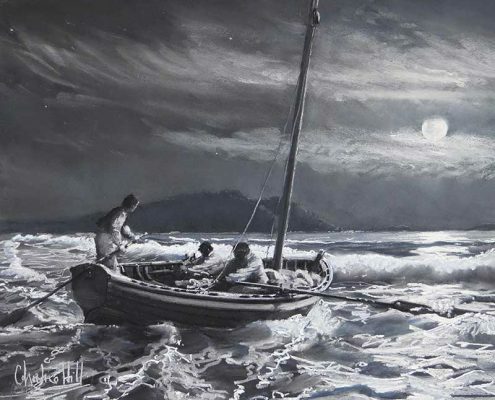 My first painting was fun to do – it described an exciting event, the ‘escape’ of the little boat and her crew from the entrance of Lake Illawarra on the night tide. Then, as I studied the maps and descriptions of their voyaging, I created an illustrated map of the whole journey. (This full-page watercolour ‘map picture’ was purchased and then donated to the Wollongong City Gallery by a very generous collector.) The project just grew from there and finally totalled eleven paintings, and with a view to one day offering them for sale or having prints made I wrote a short description of the action each one illustrated, to accompany each work. By the time there were half a dozen pictures, I was beginning to think it should be a little book. 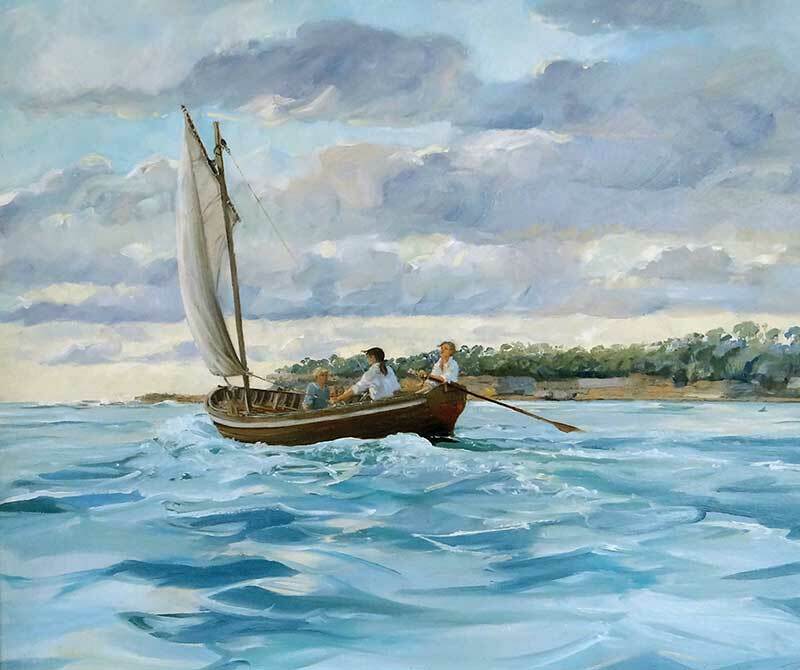 Work continued – Providential Cove, then Port Hacking were completed. The final painting was to have been a scene of the Tom Thumb II sailing out of the Hacking River estuary on a clear morning. 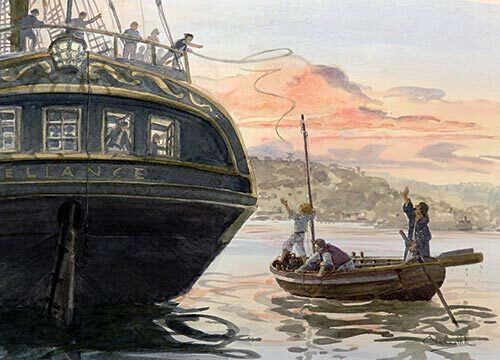 This was not to be, because my Editor suggested (very strongly) that there needed to be one more painting – a picture of the very end of the journey, of the Tom Thumb II coming alongside the ship HMS Reliance “just after sunset” on the last day of the voyage. This turned out to be more tricky than any other illustration in the set – what did the Reliance look like? No photos of course, and apparently no genuine illustrations from the time. I asked my friends in the Australian Society of Marine Artists, for there are many sailing-ship experts amongst the membership, and sure enough Karl Marquardt who is very knowledgeable about 18th century Royal Naval ships gave me some important information: the HMS Reliance used to be called The Prince of Wales, and had been one of the ships of the First Fleet. She had already been to NSW in 1788 before being purchased by the Royal Navy in 1793 and her name changed! That made all the difference, and in no time at all I found a fairly reliable image of The Prince of Wales and was able to compose an image of ‘just after sunset’ in Port Jackson, March 1796. Had I known the paintings would eventually be going into a picture-book, I would have chosen to keep them all in the same style and the same size. This is something to know before starting any future illustrated books! SO – pictures all done. How to get it into a book ready for print? In my first setting out of ‘book ideas’ on the home PC, using Word, I wanted to have one illustration with its description on each double-page spread. This rather limited the amount of text and pages were written and re-written; arranged and then re-arranged. It seemed to take forever. By this time I had also met several other successful or aspiring authors at a local writers’ group and joined the (worldwide) Society of Children’s Book Writers and Illustrators (SCWBI). They were all so informative and helpful, but it soon became clear that getting a publisher to accept any new work is not easy; doubly so if the author is both writer and illustrator. I ‘pitched’ my idea at a couple of publishers, but was not really confident. More work was needed. After checking the shelves in bookshops, I saw that many books have a monochromatic, nearly black-and-white image for a cover illustration, so I used my ‘Running Before the Storm’ painting for the cover in several dummy books I made, playing around with layout. First of all, Microsoft Word is not a program which is used by the printing industry. After I turned my Word version over to Frances Robertson, my friend/editor/graphic designer and technical go-to person, we talked more about the design and layout and what I wanted to achieve. The content of the book remained the same, but Frances had a much better idea for the cover – bright and colourful – and that was a major change for the better. 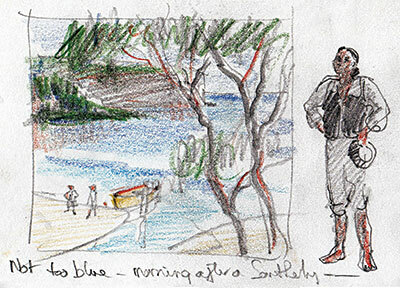 Again I submitted the book idea to a couple of publishers – the NLA felt predicted sales would not be sufficient to recover costs, and a publisher of maritime-interest books thought much the same but suggested if I made an illustrated book of the whole of the Investigator voyage (circumnavigating and mapping the Australian continent which took a year) he might be interested. I realised I would have to think about self-publishing . . .
At this point, the tricky stuff was taken over by Frances – she knows all about International Standard Book Numbers (ISBNs) and how to record a book with the National Library of Australia. She knows all about website and hosting arrangements. She knows about a million technical things that escape my artistic brain and calmly took over. As she worked, she was transposing my original work into a professional program for laying out books, called InDesign. Frances is a brilliant editor and between us we refined the text of each page in an effort to be clear and very precise with each description of the events shown next to its own illustration, but hopefully not losing the 18th century ‘voice’ by including Flinders’ own words. Also, the body text has to be set out completely separately from the cover, so there are two documents which go to print. The question of copyright reared its head. Would I need to obtain permission to quote Matthew Flinders? A two-hundred year-old document that’s pretty much out in the Public Domain? I checked with the NSW State Library who said I needed to ask Greenwich Maritime Museum in London; the people at Greenwich said permission must be obtained. I posted a letter of request with a carefully handmade dummy book and soon came a reply. Very politely, I was informed that all Flinders’ works were copyrighted until 2037; in recent years the Museum had not been able to contact the copyright-holder but they were hopeful of a breakthrough soon. another added the suggestion that I keep the number of quoted words to less than 100. Finally in desperation, still with no news from Greenwich, I made email contact with the committee which commissioned the statue of Flinders at London’s Euston Railway Station in 2014. Had they had any trouble with permissions? Well I instantly had several new friends and I am pleased to say that a distant relative was able to contact not only Ms Lisette Flinders Petrie and obtain permission for me; he also coordinated a new rapport with Greenwich. Success! One of the people from that group has sent me a copy of a book he wrote about Flinders, to add to my collection. How very kind – what would we do without the internet?! There are many self-publishing websites on the internet. Most offer editing and design services as well as just the printing, at an extra cost. Frances has previously worked with some and did more research. In order to keep their prices attractive, these sites offer templates for printed books, but I wanted a certain style and it needed to be in colour. We found Ingram Spark had just what I wanted. To settle the matter, I read a ‘How I did it’ story in the SCWBI newsletter from an author who self-published with this firm, and she was very pleased. And the price seemed about right. Ingram Spark is a print-on-demand firm; one can order anything from one book to very many and the price of each book remains the same (postage for size and weight will vary, of course). Frances found Ingram Spark fairly easy to work with; although the setting-up required for printing was very technical she has the knowledge and queries were always promptly answered. Their headquarters is in the USA but with branches in the UK and Australia; my printing was done in Melbourne, mostly. I say ‘mostly’ because with Frances happening to be visiting the US at the time of our first print-run. We had a copy delivered to her there; it was printed in the US and arrived within days, whereas the one I ordered in Australia took nearly two weeks to prints and arrive in Thirroul! By the time the first few books arrived, I had copyright permission from Ms Flinders-Petrie. We added the correct acknowledgement in the information page of the book, corrected a few ‘typos’, submitted a new printable document and ordered a hundred books. Phew! So now I have to promote my book. It’s not so different from organising an art show, and I have lots of help from the local Library. I need to approach bookshops – including specialised ones, and those local to the area between Botany Bay and Lake Illawarra – because the subject-matter of the story is likely to particularly appeal to South Coast inhabitants and visitors, historians and the boating fraternity. 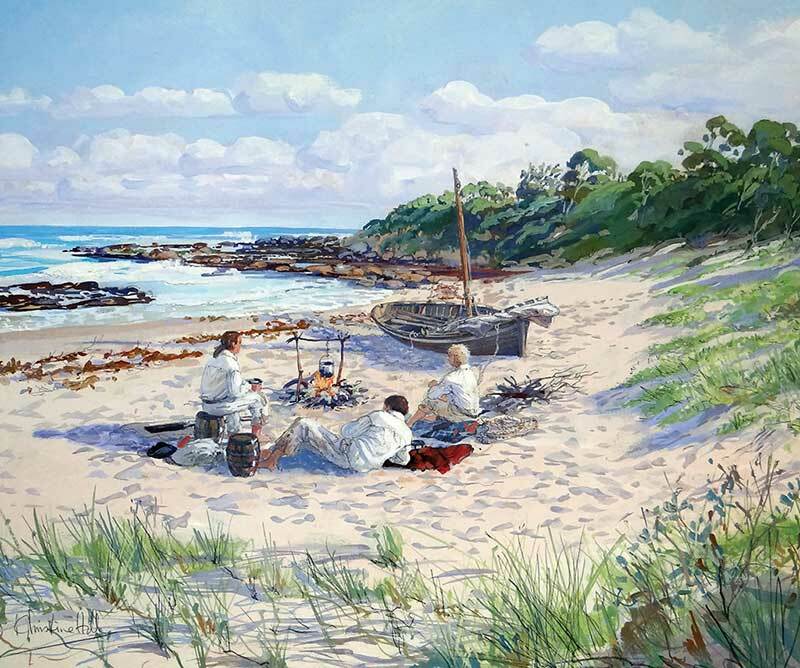 In situations like this, many of the audience already know the story, perhaps remembering it from their schooldays, and have perhaps visited any of the landmarks where it is remembered with a monument: Bass & Flinders Point, Cronulla, or Towradgi Beach near Wollongong. The story as Matthew Flinders wrote it in his manuscript is much more detailed than mine – I hope that readers wanting to know more will seek out one of the many other books published in recent years about him and his life – and about George Bass too. I just thought it was about time there were some illustrations of the adventures they had in beautiful places on my local coast.